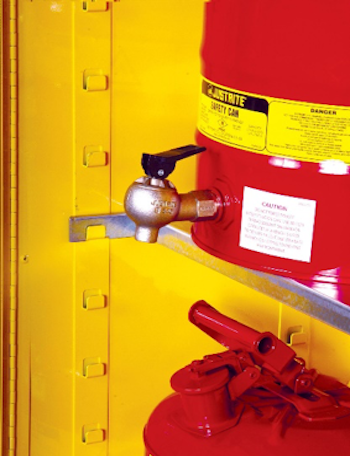 No matter how careful you are when handling and storing flammable or hazardous chemicals, spills still happen - even within a safety storage cabinet. Never leave spilled chemicals in a safety cabinet. Clean them up immediately. Corrosive chemicals could damage the cabinet. Flammable chemicals may catch fire. And, some chemicals are reactive with others, creating a risk of explosion. Justrite SpillSlope shelves slope backwards, away from the cabinet user, to safely direct spills towards the leakproof sump at the bottom of the safety cabinet. The patented design reduces the chance of containers sitting in pooled liquids within the safety cabinet. Constructed of durable, galvanized steel, SpillSlope shelves meet ANSI standards with a 350-lb. (159-kg.) safe allowable load. Their bi-directional design offers easy installation. Safety cabinet shelves rest on welded shelf hangers. These are interlocking for increased stability. Shelves can be adjusted on 3-inch (76 cm) centers. The sturdy structure and versatile placement of safety cabinet SpillSlope shelves accommodates different size containers and maximizes safety cabinet storage space. Inspect safety cabinet shelves and sump often and clean up spills immediately. Because plugs are vulnerable and can be mishandled, there are no drain plugs in the sumps of Justrite storage cabinets. Additionally, both OSHA and NFPA 30 mandate a two-inch leakproof sump. Use sorbents and rags for cleaning up spilled liquids. However, never leave sorbents within a safety cabinet as a preventive spill measure. Sorbents are not designed for long-term, unattended use in any closed or confined space. When using rags and cloths for cleanup, always dispose of in an oily waste can to prevent fires caused by stray sparks or spontaneous combustion. Safety storage cabinets serve an important purpose, so it's essential that your cabinet meets all your needs. Whether you need to expand storage on existing cabinets or create a more convenient workflow for your new cabinets, Justrite offers SpillSlope shelving options and accessories across its range of steel cabinet sizes and styles. Use a SpillSlope dispensing shelf to easily dispense liquids from a faucet, without having to adjust the can's position on the shelf. The 11-inch depth allows the faucet to protrude beyond the shelf. It can be fitted to all 30- and 45-gallon safety cabinets. Place polyethylene trays on top of shelves for protection from corrosive chemicals. Three options are available - combination shelf with poly tray, shelf alone or poly tray alone. Justrite light blue steel acids cabinets and dark blue hazardous material chemical cabinets include poly trays. Steel shelf dividers are suitable for small bottles and containers. They fit directly onto the shelf and slide into position. They help organize cabinet contents and provide easy differentiation of chemicals on a single shelf. Contact Justrite to learn more about SpillSlope shelves for safety cabinets. Select the number of shelves and shelf layout based on your chemical storage needs.